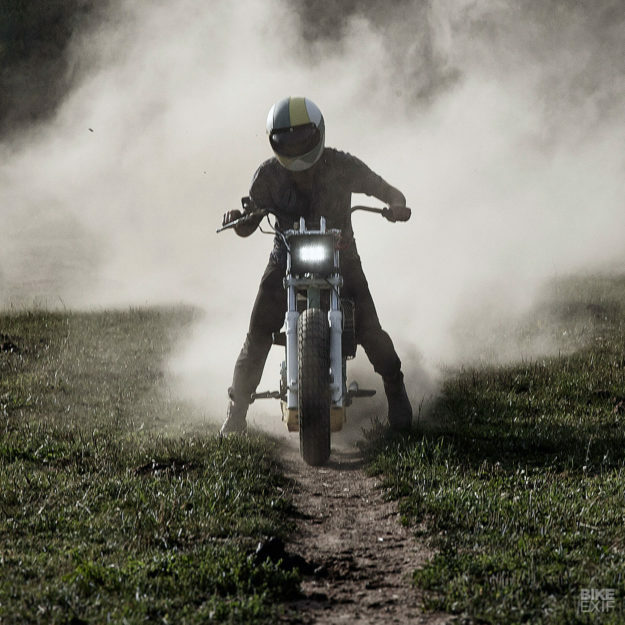 Most customs start out as old bikes in dire need of resurrection. Taking a grinder to an old beater is cheaper than tearing into a brand new machine, and the results are often more appealing, too. 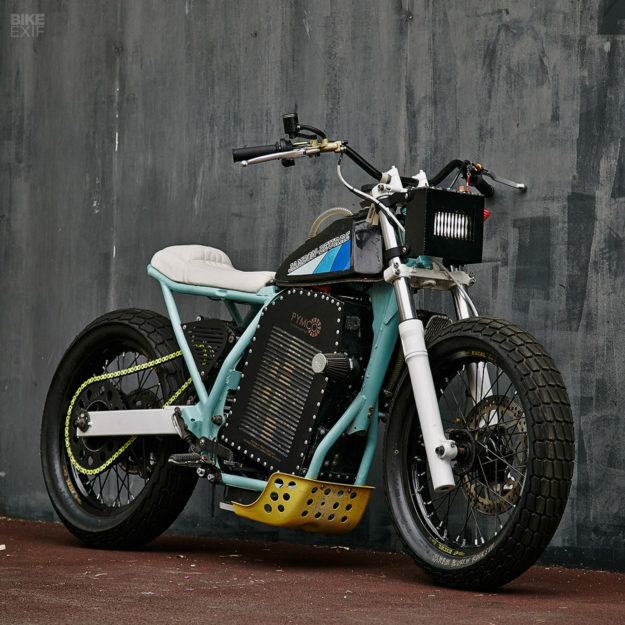 But that’s not an option when you’re customizing an electric motorcycle: they simply haven’t been around long enough. 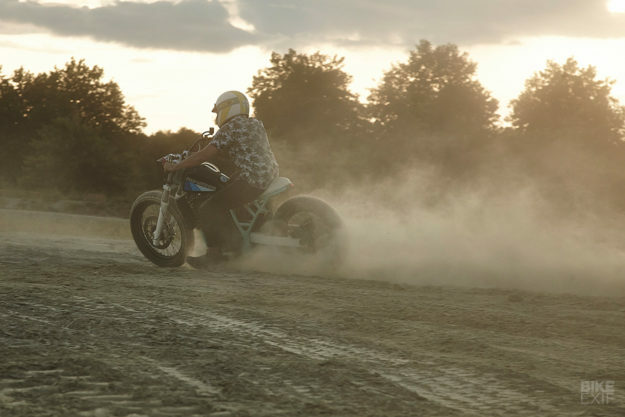 So how did a small French outfit build an electric flat tracker with all the old-school charm of a barn find? 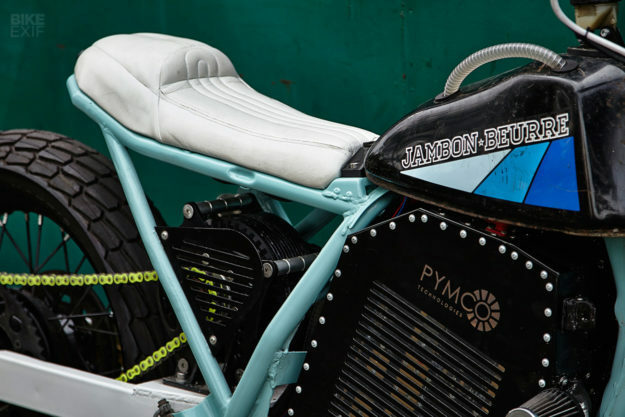 Jambon-Beurre Motorcycle is a custom shop based in Paris run by Antonin (a fashion photographer) and Benjamin (a finance executive from the automotive industry). The enigmatic duo normally wrenches on 80s and 90s machinery, but thoughts of an electric project had been percolating since last year. Since this was an in-house project with no client picking up the tab, JBM needed a way to finance it. They found a sponsor in the publishers of a quirky French comic book about ‘Jean-Louis‘—a character from the past who searches the French capital for cool products. The comic is a vehicle for highlighting real-world designers and creators, so it was a perfect fit. And in return for their support, the publishers now use the bike as a marketing tool. Next on JBM’s list was finding a way to power their creation. They sourced a 80 kW / 180 Nm liquid-cooled, brushless power plant, originally designed for military drones. 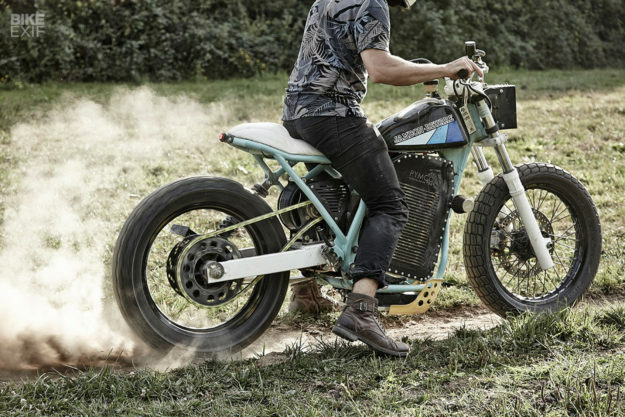 They then partnered up with PYMCO Technologies—a French startup specializing in electric power management. Together they developed a custom 6.5k Wh / 110 V battery pack, using 580 lithium-ion cells to deliver 800 A. It takes two and a half hours to charge fully on a standard electrical system, but only 20 minutes on a special car charger, and has a range of 100 km. The package can manage zero to 100 kph in three and a half seconds, and is limited at a top speed of 160 kph. 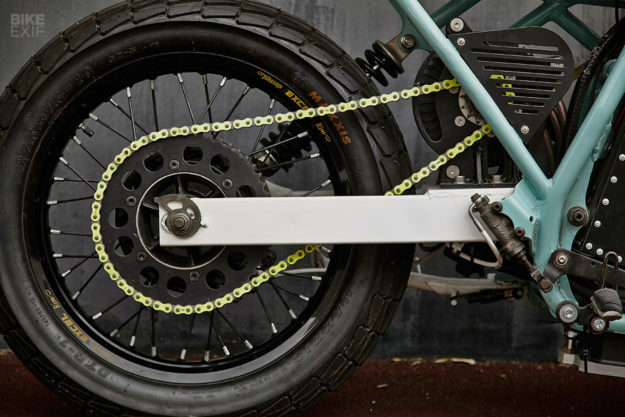 The whole bike is refreshingly light at 350 pounds (159 kilos). 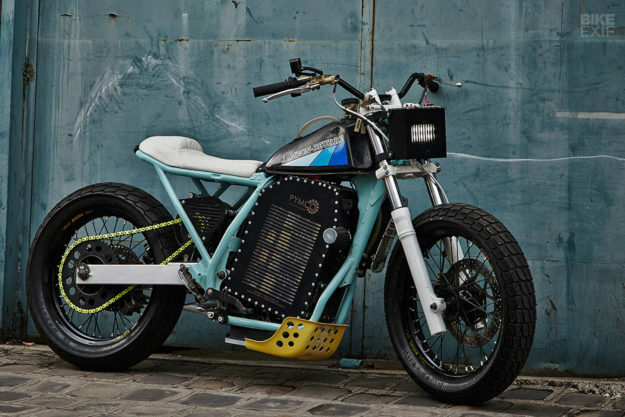 So what did Antonin and Benjamin cram their new power unit into? 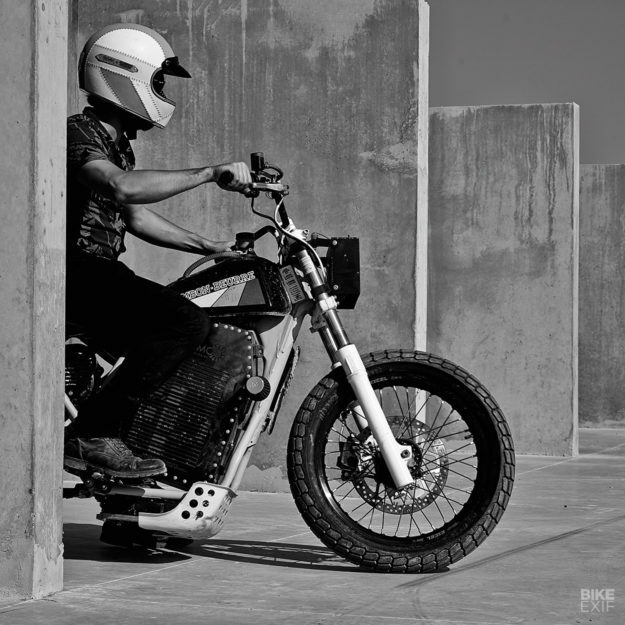 The guys are mute on the specifics, but reveal that the rolling chassis is from several donors—including a Suzuki DR800, a Honda XL and even a classic BMW. This mix of old and new meant designing a bunch of components to hold everything together; these were all either machined, laser cut, water jet cut, or 3D printed. The front suspension was shortened to perfect the stance, and the wheels rebuilt with 19” Excel rims, wearing flat track rubber. An old Suzuki TS 125 unit now sits up top, chosen for its typically 80s angular look. It’s been hollowed out to accommodate electrical components, a water-cooling pump and a special regenerative braking system. The regenerative brake setup is pretty interesting. 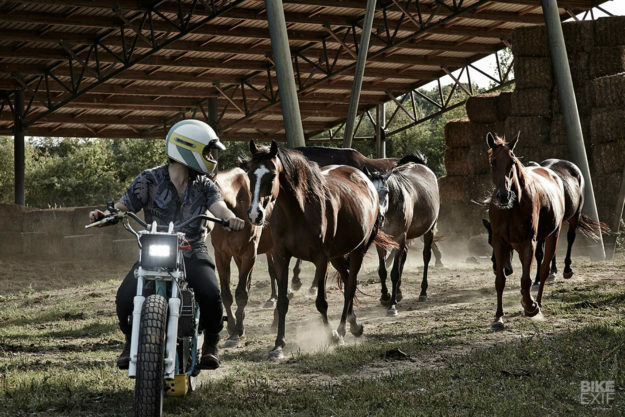 JBM plan to field the bike in flat track races, and realized that a lack of engine braking would be a hindrance. So with PYMCO’s help, they designed a system to simulate that. 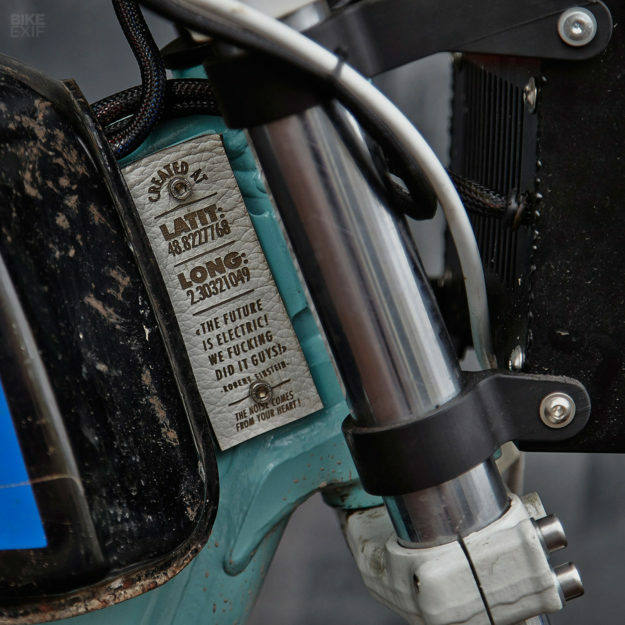 What looks like the clutch lever is actually a second brake—the amount of force applied to the lever is converted into a variable signal that then modulates an energy regeneration brake. Very clever. JBM have also loaded the bike with a few offbeat touches. Take a look at the headlight: it was originally built as a battery box for another project, but that didn’t work out. Now it’s kitted with an LED light, and mounted on 3D printed brackets. It also hosts a bunch of switches and a tiny Motogadget speedo. Everything’s wrapped in a paint scheme inspired by 90s sneaker design. The seat’s been covered in white leather, courtesy of Maximus Paris—an artist who works with leather…and feathers. 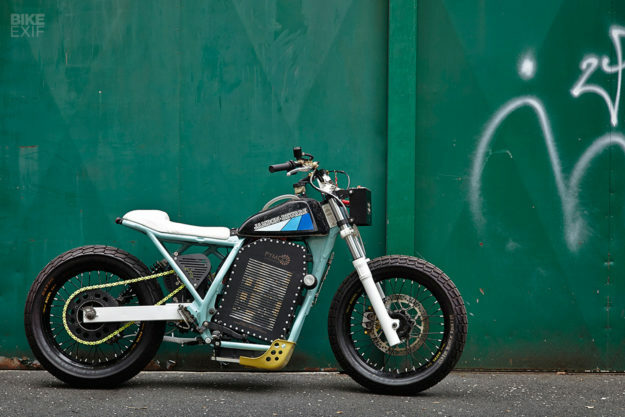 It took JBM six months to build this electric tracker, but its story is far from over. 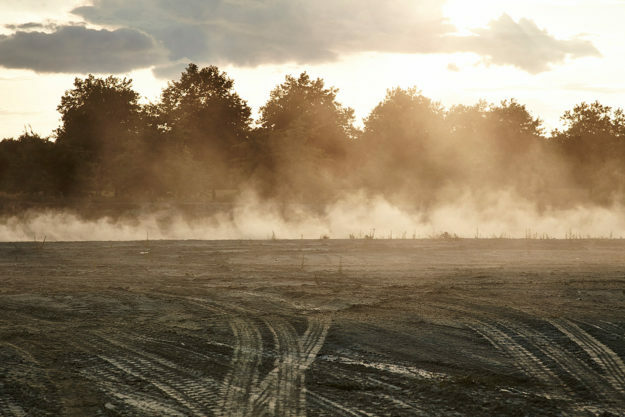 Next year, trail freestyle rider extraordinaire Julien Dupont will be piloting it in the French dirt track series. And they’re already working on a funding campaign to take this from one-off prototype to limited production. 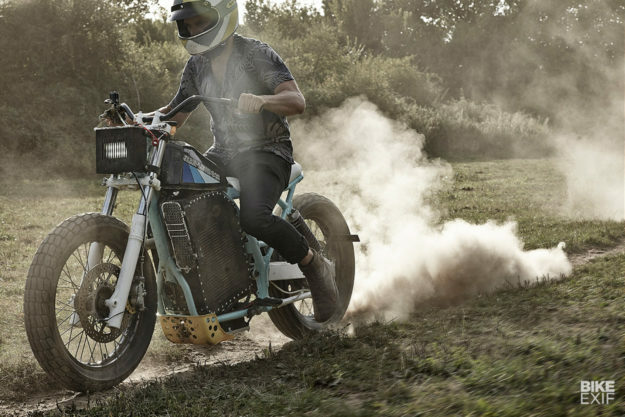 JBM set out to prove that electric bikes can be just as cool as gas-powered rides, and they succeeded. 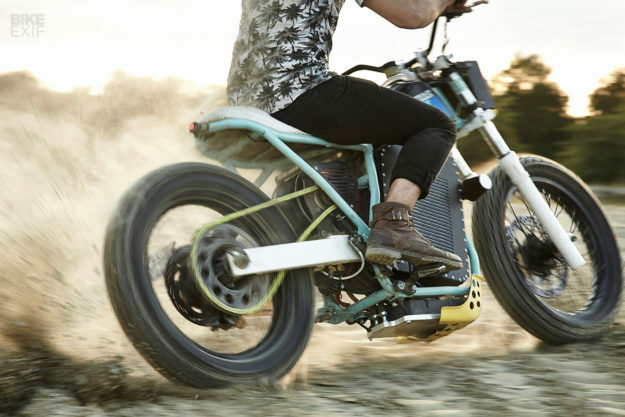 Their tracker might be packing serious tech under the hood, but it still gives off an easy-going, fun-loving vibe. As if to illustrate that point, this photoshoot wasn’t planned. Ben took the bike out for a test ride, the light was right, and Antonin grabbed his camera.